– Raid 325: a small, ultra portable kayak, weight just 13kg/28lb. 325cm/10.5ft long, 53cm/1’7″ft wide (61/2′ with Stabilairs), suitable for one person up to 80kg/176lb. One of three in the Nautiraid kayak range that packs into just one bag. – Raid 416: This folding kayak is light and easy to manoeuvre, stable, suitable for river and sea touring. 416cm/13’6″ft long, 59cm/2ft wide (70/2’2″ with Stabilairs inflated), weight 17kg/37lb, capacity 130kg/286lb. Price from £1995, depending on specification. Packs into just one bag. The third kayak in the range to pack down into just one bag is the Grand Raid 500 Alum-PVC model. 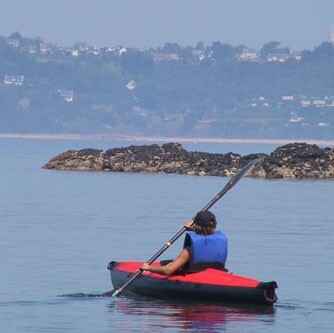 Nautiraid Canoes and Kayaks are available in four colours; grey, white, blue and red. Call us before ordering to discuss your requirements and colour preference. Depending on what we have in stock some may need to be built to order. Nautiraid coracles, kayaks and canoes are lovingly built here in the factory workshop in France. See Accessories for all kayak additional options and extras. See Nautiraid Sept 2017 for pricing and specification information.